“My Crazy Family” from Christian Faith Publishing author Stewart Jones is an inspiring collection of relatable sentimental experiences, filled with both laughter and tears. “My Crazy Family”: a poignant story that presents a virtuous message of love, acceptance, and faith throughout one’s entire lifetime. “My Crazy Family” is the creation of published author, Stewart Jones, a Vietnam War veteran and a passionate writer and author. Published by Christian Faith Publishing, Stewart Jones’s new book is both enthralling and emotional, with its memorable recollection of past events told in a vivid description of what life is all about. Throughout one’s life, there are experiences that can take a toll, while others are enlivening. Most of these experiences certainly revolve around the family setting. Jones’s memoir perfectly illustrates these ups and downs in life. Readers are invited to delve into these touching events with open hearts and minds, and fully understand the essence of one’s self, family, and life in totality. View a synopsis of “My Crazy Family” on YouTube. 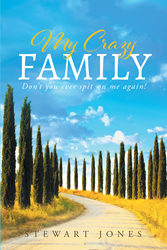 Consumers can purchase “My Crazy Family” at traditional brick & mortar bookstores, or online at Amazon.com, Apple iTunes store, Kobo, or Barnes and Noble. For additional information or inquiries about “My Crazy Family”, contact the Christian Faith Publishing media department at 866-554-0919.